I have to admit that I’ve NEVER seen any Poirot — vintage, modern, you name it. I’m sorry, gods of all things 1930s! Recently my film-buff husband made me watch Evil Under the Sun (1982) which I actually quite enjoyed, so we followed it up last week with Death on the Nile (1978). I particularly wanted to see the latter, as it won the Oscar for Best Costume Design that year. I’ll talk about the two in chronological order, though. 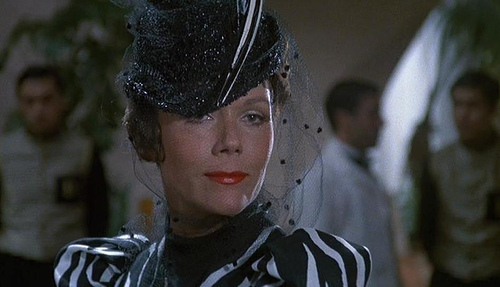 In terms of costumes, yeah Death on the Nile was pretty darn stunning. Evil Under the Sun had some good elements, but let too much of 1982 creep in. 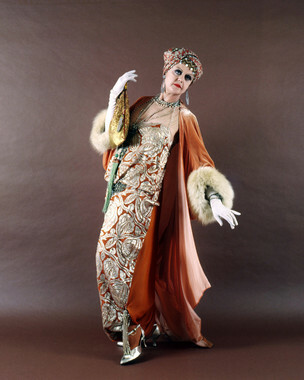 Both were designed by Anthony Powell, who won the Academy Award for Best Costume Design for Death on the Nile. He also won it for Travels With My Aunt (1972) and Tess (1979) and was nominated for Pirates (1986), Hook (1991), and 102 Dalmatians (2000). There’s some lead up, but essentially, a whole bunch of Brits end up on a boat headed up the Nile River in Egypt. You’ve got Poirot (the Belgian detective); a wealthy heiress and her new husband, who she stole from her best friend (Mia Farrow) and who is along to make the newlyweds’ lives hell; the heiress’s maid and her lawyer; Bette Davis as an older rich lady with her companion, the testy and very boyish Maggie Smith; Angela Lansbury as a hilariously dramatic romance novelist, along with her shy daughter; a colonel; a communist; and a famous doctor. Phew! I don’t want to give away too much plot, so let’s just get to the costumes, shall we? The cast generally wears white, cream, and beige with touches of black for daywear, which 1) creates a perfect ensemble look, and 2) totally creates that “Brits abroad somewhere hot” feeling. Linnet is the beautiful American heiress who steals her best friend’s husband. She gets some gorgeous evening gowns! Here’s one of those evening gowns. Very slinky, bias cut, and sparkly. Here she is with her new husband, Simon. Very nice “sport” clothes. Linnet is very fashion forward, as you can see by this outfit. LOVE the neck dealiebob. Linnet’s ex-best-friend is Jacqueline, played by Mia Farrow with a questionable English accent. She’s decently slinky and sparkly too. 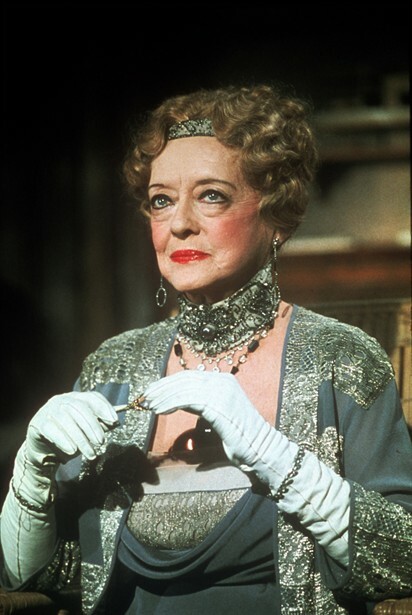 Bette Davis’s wardrobe ROCKS. 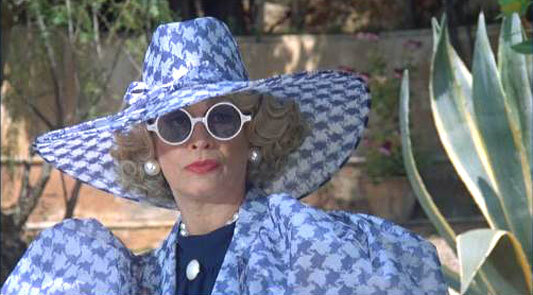 I aspire to be this fabulous when I am older. 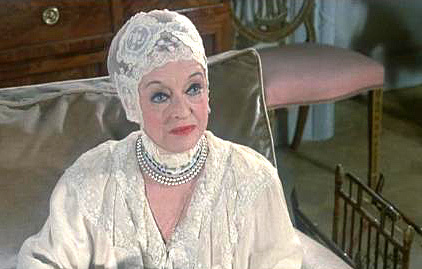 In her first scene, she’s wearing this hilarious-but-fab lace cap. This black-and-white ensemble is so great. The sheer lace is gorgeous, and the hat with the silver trim! So good! She’s always dripping with jewels. Love the metallic trim. Here’s that dress on display, on the right. 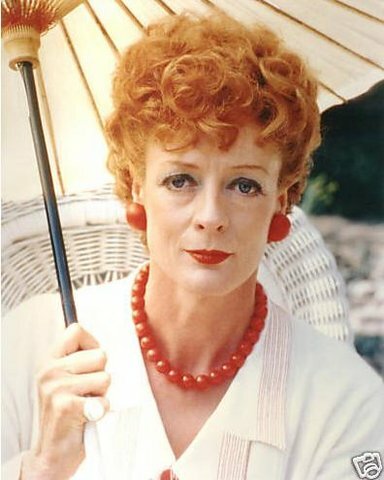 Maggie Smith is Bette Davis’s hired companion. She’s tart-tongued and rocks the menswear look down to suits, ties, and pocket squares. All dressed up in a tux with Marcel waved hair! 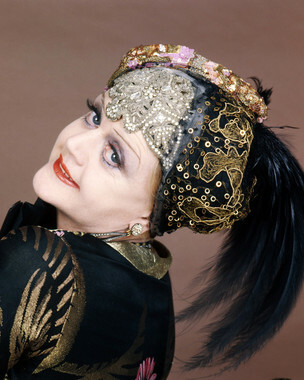 Angela Lansbury is the other standout. Not only is her character hilariously dramatic, but the costume designer put her in perfect Orientalist, OTT robes and turbans! THERE IS SO MUCH THAT’S GOOD ABOUT THIS OUTFIT. The silver embroidery on that luscious shade of orange. The fur trim. The headdress! More Orientalist, crazy dramatic ridiculousness. Black and gold and feathers and fringe and drapery and beads and sequins and silver and embroidery and metallic and turquoise and and and! Poirot himself looks dapper, as does David Niven as the colonel. It makes me very happy to see a man of size dressed gorgeously. The mustachios! The Marcel wave! Poirot sleeps in a hairnet that crosses over to cover his mustache — I wish I could find a screenshot. The heiress’s maid, who perfectly captures that 1930s look in her uniform. I haven’t seen the other films nominated for that year (Caravans, Days of Heaven, The Swarm, The Wiz), but I’d say that Anthony Powell’s win was richly deserved, just based on the quality of this film. This film came out four years later, with many of the same actors as Death on the Nile. 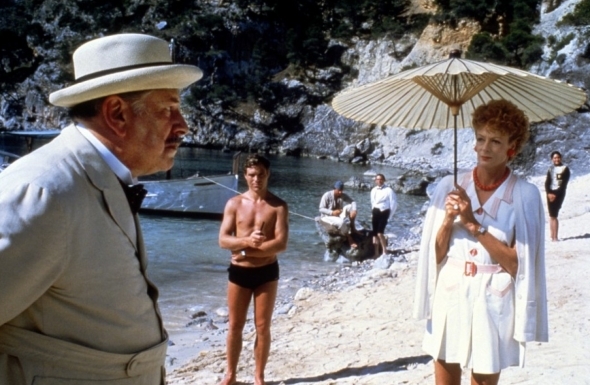 This time the setting is a remote Mediterranean resort in the fictional country of Tyrania, which is run by Maggie Smith’s character, a retired actress and former mistress to the King of Tyrania. Again you’ve got a bunch of Brits on holiday in a closed setting. This time, Poirot is joined by Arlena (the starting-to-age star actress, played by Diana Rigg), her new husband and his daughter (who is NOT happy about her new stepmother); Patrick and Christine, a young-ish couple — Patrick clearly cheats right and left on Christine, who is very wallflowery; the American producer and his wife, who are desperate to get Arlena to star in a new theater production; and Roddy McDowall as a songwriter. The story and dialogue are just as good as Evil Under the Sun, and again the movie takes its time setting up the plot and characters, and gives you a slight chance at being able to solve the murder (but very slight). Arlena the “stah” arriving at the resort with her new husband. I love the stripes and that hat is to die for, but those sleeves read 1980s to me (okay yes, 1930s was about poufy sleeves, but why does this seem 80s and not 30s? Maybe I’m just crazy). Arlena in a slinky evening gown. I like this number, even if the turban just reads “old lady” to me. It’s hard to see past the “Solid Gold” effects, but here’s your slinky evening gown in color. Arlena has a great fingerwave hairstyle, and her hubby’s slicked hair is period perfect. This outfit is SO 1982 to me. The colors! Ugh! Great hat, but the outfit just reads Nagel to me. Now we’re back in business. 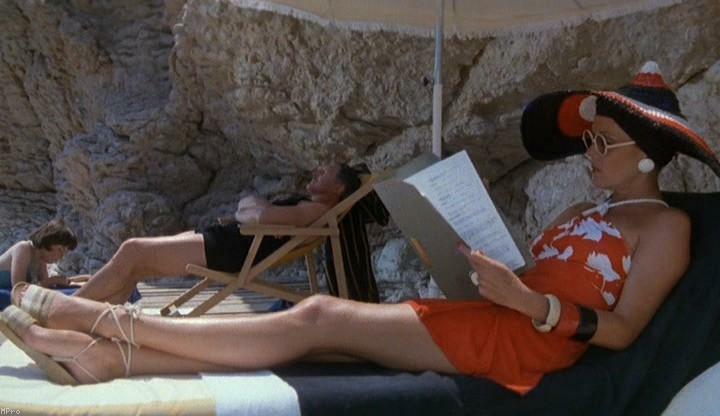 Fab swimsuit, love the espadrilles, and another great Chinese-influenced hat. It pains me to snark Maggie Smith, BUT HER HAIR. SO 1982. SO WRONG. Maggie’s hair just ruined every outfit for me. 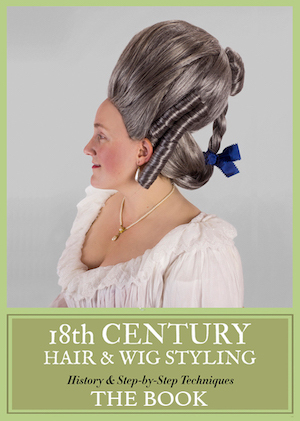 I’m sure this outfit is fine as 1930s, but with the hair…! This is a nice playsuit, if I can ignore the hair! Sparkling with Arlena. The two have a hilarious rivalry and get the claws out regularly. Patrick and Christine both look great. 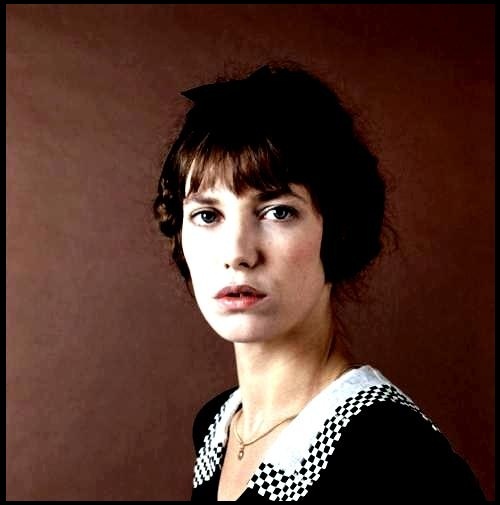 I love Christine’s slightly-bohemian look. Even when she’s dressed up, she sticks with it — note the Frida Kahlo braids. 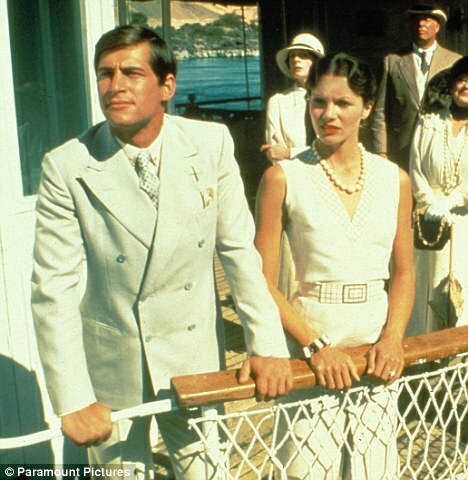 Some of Myra’s — the American producer’s wife — outfits work for me, like this navy and cream ensemble. I’m not sure if this one is 1930s or 1980s, but it’s ugly. The fabric also reads NYLON to me. 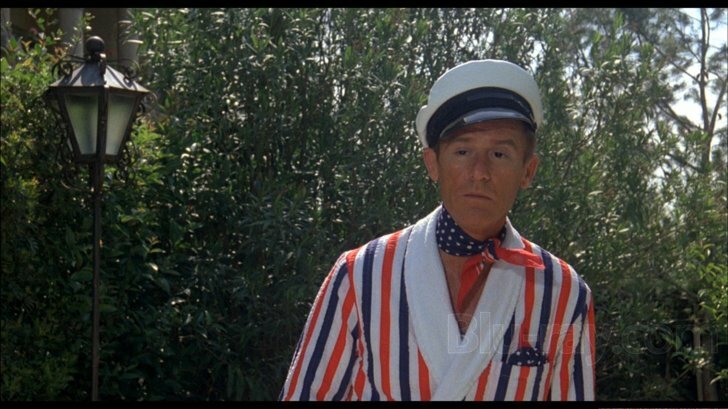 Rex (Roddy McDowall) goes full nautical to fabulous effect. Of course, Poirot himself looks dapper as always. I particularly loved this bathing ensemble. The robe, the cap, and the piped belt are all perfect! 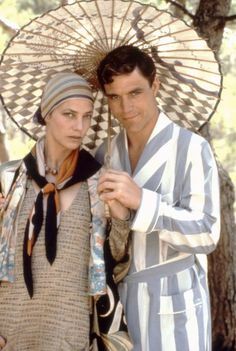 All in all, both were very entertaining, but Death on the Nile wins hands down for accurate and gorgeous costumes, while Evil Under the Sun gets knocked down a point or two for letting the 1980s creep in. Are you a Poirot fan? Are you an art deco fan? What do you think of these films and their costumes? Loved both films. Ustinov played Poirot as well as anyone before David Suchet, who has probably established the benchmark for future actors. But you hit my English button with the “Big Reveal”! I hate this rubbish of using verbs as nouns because apparently the younger generation is too poorly educated to know the difference between verbs and nouns. Revelation and failure are still the proper nominative forms despite what TV commentators seems to think. Not only is Suchet pretty much the definitive Poirot—this according to Christie’s grandson—but the period feel of the programs is spot on, starting with the opening Art Deco animated credits—complete with a De Chirico finish—and playing through in the sets and costumes. 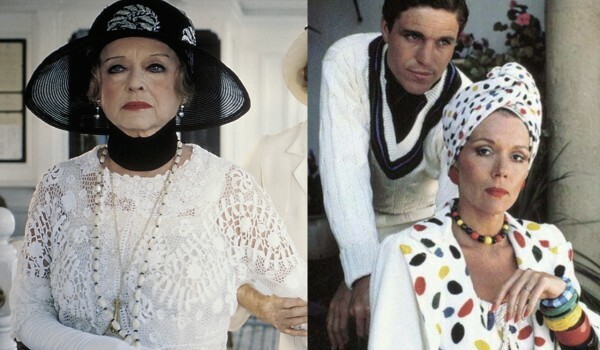 If you enjoyed these two, then you really *must* see the 1974 version of “Murder on the Orient Express.” Stellar cast, excellent story, and the costumes are glorious. 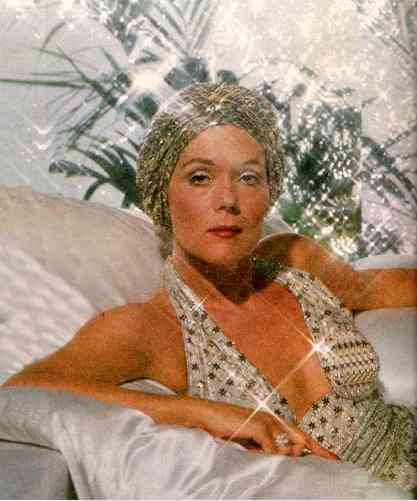 Whenever I’m feeling drab and humdrum, I watch this to remember what glamour used to be. Yep. 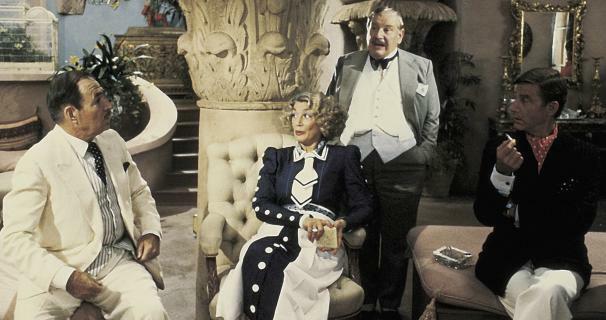 James Coco was an excellent Poirot, and I believe Ingrid Bergmann won a Best Supporting Actress Oscar for her role. You are so right! It was indeed Finney. But he sure looked like Coco in that makeup! Also, Niven and Ustinov were old chums. They served in the Army together, and Ustinov was Niven’s batman (military valet). Since Niven was seconded from a Highland regiment to the Commandos, it must have made for some interesting times for Ustinov. For anyone who might not know. Patrick MacNee, Niven’s cousin, served in the Royal Navy. Evil Under the Sun is one of my favorite movies of all time! (Next to REBECCA) – SO happy you got around to a Frock Flicks review. Even as a little girl, I knew it was very 80’s in its 1930’s way, but I just didn’t care :) I used this in Grad School in one of many semesters of Costume History when we analyzed costumes in film – noting elements of when the contemporary influenced the film’s time period. Death on the Nile – also a classic! 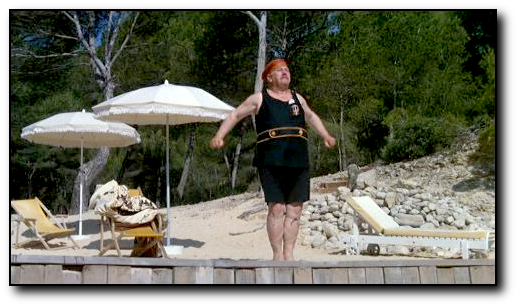 I just love Ustinov as Poirot – but Souchet is also fantastic – and that series has great costumes! Her accent is “questionable” because her character is an American (with Latin ancestry) who went to school in England. Okay, I missed that factoid! That helps! I think you’re reading too much into the 1980s aspect of the costumes for “EVIL UNDER THE SUN”. The movie was set in the late 1930s, not the early or mid part of that decade. And you also have to take into account that most of the characters are/were in show business or came from new money . . . aside from the Redferns, who were definitely middle-class. 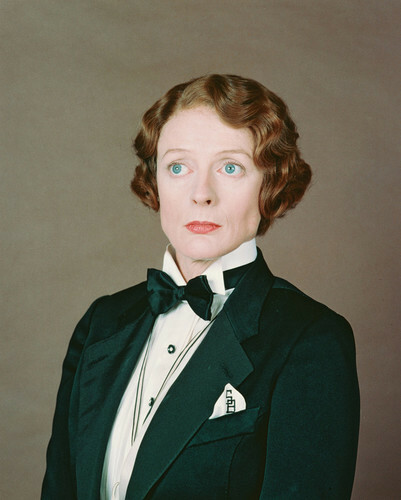 You’re probably right about me seeing too much 1980s… Except for Maggie Smith’s hair! Gah! 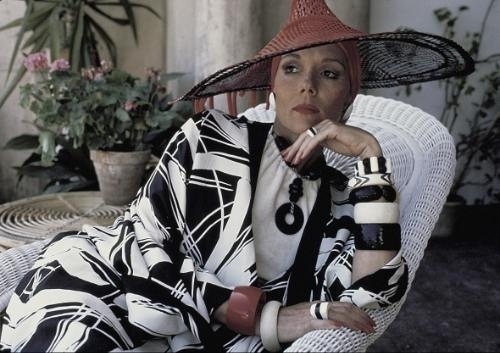 you didn’t show my absolute favorite outfit from Evil Under the Sun – Christine’s stunning black & white ensemble, at the end, when she wasn’t playing the mousy wife anymore. I’ve always wanted to wear that outfit! I was worried that showing that would spoil things! Both films were quite entertaining! 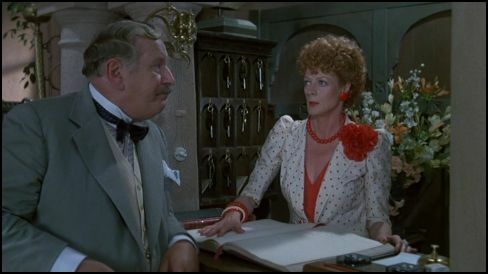 I liked Peter Ustinov as Poirot (although I’m told that he may not be everyone’s ultimate Belgian detective), and I liked the twee British-ness of them both. David Suchet is regarded as the best Poirot. However, I believe that both Ustinov and actor Alfred Molina were just as good in their own ways. 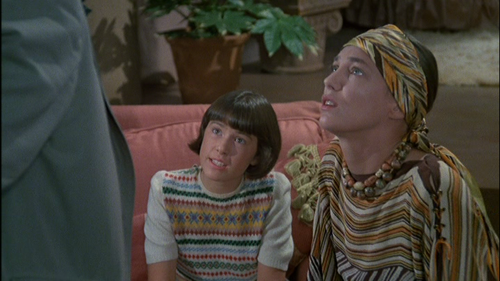 I love the costumes for “Death on Nile”. My feelings about the costumes for “Evil Under the Sun” seemed a bit too theatrical at times . . . like 1974’s “Murder on the Orient Express”. Love both of these films! I’m a published paper doll artist, and am currently working on a paper doll set of characters from “Death on the Nile”…the intricate costumes are challenging, but it’s a labor of love! I too had moments of amusement watching Death on the Nile, and I really enjoy when designers get right things like the period bathing dress and bohemian looks. I would love your take on the BBC Suchet Poirot series. Miss Lemon’s costumes are great imho although not sure if they are technically accurate to Christie’s original character who I thought was supposed to be more doudy. She is fastidious though which totally works costume wise. There are so many details in the series that I find them a stylistic pleasure to watch.